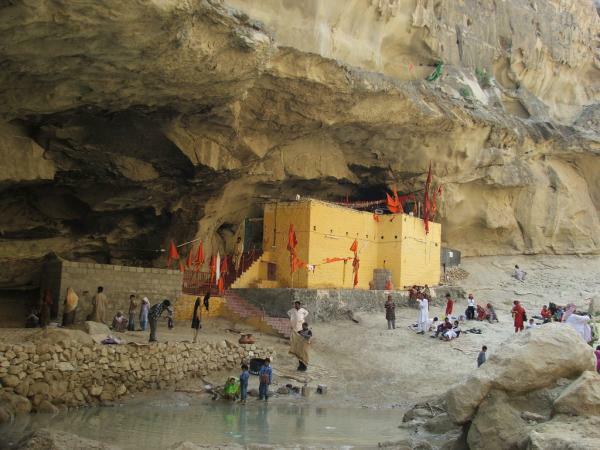 Hinglaj Mata Ji Temple, in the Balochistan province of Pakistan, is a Teerath (Pilgrimage) of past gods. Its a sacred place for Hindus specially the devotees of Aadh Shakti Devi Maata. The temple is situated in the mountain cave “HINGLAJ” on the river bank of “HINGOL” at the tail of Keerthar Mountains called Kanraj in Tehsil Lyari, District Lasbela of Balochistan, Pakistan. The place is considered to be one of the famous and largest Teeraths [pilgrimage sites] in the Subcontinent. Though this article is all about faith and Guru’s blessings I would share some thoughts and try to remove some misconceptions. I gave a presentation of this pilgrimage to Rotary Club in Baroda, India in 2007. I took a poll as to how many in the audience of about 60 people had gone to Mumbai, Nepal, Singapore, UK, and USA. It ranged from about 50% for USA to almost 100% for Mumbai. When I asked how many had gone to Pakistan the answer was as expected – zero. I asked that in that case how you know Pakistan or Pakistani people and their attitudes. Obvious answer was from the TV and newspaper. I requested them to recognize that these are media outlets and they may not always be unbiased and in such sensitive relations not fully beyond influence by Government or special interest groups. I urged them to open their minds, learn as much about Pakistan and her people as possible from independent sources, and not get swayed by some populist slogans. Mind is a precious resource to be wasted by keeping it closed. I make the same appeal to all of the readers of this blog. And it is not just about Pakistan or India but it is about any individual, organization, religion or even countries – keep an open mind, don’t pass judgment without reading and learning. I am not naïve to suggest that each and everyone in Pakistan is Pro India or Pro Indians. Just as it is not the case in India about the attitude towards Pakistan. There are elements that have extreme views of Islam that want to stay faithful to their interpretation of the Holy Book that are very much different than what the world is all about. Forgetting that most of the religions evolve over the time and the so called “rules” are appropriate for the time it was written. Only the basic tenets remain fixed (call it 10 commandments or whatever). However lumping the majority of the people with these extremes and painting a picture of the entire nation and her population dominated by these extreme views and acts does no do justice to the nation, her people and yourself. We can end up missing the forest for the trees. I was very much impressed by the massive, very clean, fully air-conditioned Karachi airport with very courteous staff at the airport and on the PIA flight. The road to the hotel was void of any slums, lined with trees in the center lane of the boulevard. I was treated with the highest level of hospitality from the door man of the hotel all the way to the Managing Director of a firm. I think that this hospitality either equaled or exceeded the famous hospitality of Saurashtra (Kathiawad) and was almost like the legendary hospitality of Pathans (Pasthuns – Kabuliwala) of the Khyber Pass. I was told that people would rather have the democracy vs. military rule but in the same breath they said that whenever there was a democratic rule it was mainly to fill the Swiss bank accounts of the leaders and whenever there was a military rule they would see improvement in the infrastructure of roads, rivers, trains, telecommunications etc. vs. Swiss Bank accounts being filled up. Lot of people told me that they look up to India as to how she has progressed by quantum jumps though both countries gained independence at the same time. My taxi driver told me that though there are Urdu TV channels but many watch some 30 plus channels from India. As I mentioned earlier I saw that Hindu temples are maintained for most of its parts and the Government is restoring some of the historic temples under World Heritage. In general, I did not encounter any hostility against India from public. Sure there are fanatics (like in India too) but they are a very small – 3-5% of the population. Unfortunately they are loud and the silent majority has not yet taken a stand and possibly the military uses that population to its advantage but it is detrimental to the society in general. My host for the pilgrimage Mr. Hamid Omar and MD of Getz Pharma Mr. Khalid Mahamood had an AK-47 totting guards at their home. They mentioned that in past their wives could roam in streets of Karachi at 2 AM in the morning with no problem and now it is unthinkable. One of the reasons for this, I was told, is the sudden drop of support for Mujahideen created by US funding to fight the Russians in Afghanistan. When Russia left, USA dropped all the funding and support but left lot of ammunition in the arms of the leaderless and direction-less Mujahideen that the Pak Army possibly found to be useful for infiltration in India held Kashmir. Unfortunately that created Osama Bin Laden and Al-Qaeda as a leader and organization that bit back not only America, Western Countries and India but is now threatening the internal security of Pakistan itself. I hope and pray to the Almighty to bring true peace to Pakistan with peaceful and strong collaborative relationship with India. Such a grouping can create a mighty cultural, commercial, and military power in Asia and the world. May peace prevail everywhere and may Lord give Sadbuddhi (good thinking) to everyone. I am hopeful that various attempts by general population on both sides will accelerate and make the Aman-ki-Asha dream a reality and allow millions of Mata Hinglaj devotees to do their pilgrimage. I pray to Hingula Devi for improved relations between India and Pakistan soon. There are still people of my age who do have fond memories of their childhood in undivided India. Younger generation grew up without this and under misguided views of each other and they may not be emotionally interested in improved relationships. Note: Some data in the post are provided by: Hafeez R. M. and some collected by WoP research desk. Greetings to the creators of this site. A friend of my dad is thinking about visiting Hinglaj Mata Mandir. Since the official website is down, I seek your guidance. Whenever I meet someone like yourself I see the creator blessing him with all his hands. Dear resp Sir , please send me info abt Hinglaj yatra. I mean how to go? general guidance etc. bcs its very urgent. We want to go to Pak Hinglaj min 100 Devotees waiting ur reply. dear sir iam US citizan . i want to go to karavipur and hinglaj maa temple. where i can stay. which place is closes to the both temple to rich. @race2replace & Vithalsing Dalchand Pardeshi, The necessary info on visiting Hinglaj has been provided in the first part of this post. U can easily access that part by clicking on the link ‘previous’ titled Reaching the Holy, Wholesome Locale, or just click page # 1 in the footer part of the article above. I want to come hinglaj for Yatra on 21st so pls let me now how and what is d procedure to travel hinglaj as soon as possible…. @Rajendra Shah: Have a friend who can arrange Hinglaj Mata Devi Yatra. However, its possible if a minimum of 5 persons are included in a group. On single basis, the cost gets exorbitant, therefore, not recommended. Should you be able to come in a group of five or more, my friend can arrange it on an economical basis. Sorry, plz read: a group of minimum of 10 (ten) persons are more. Any inconvenience thus caused is regretted.